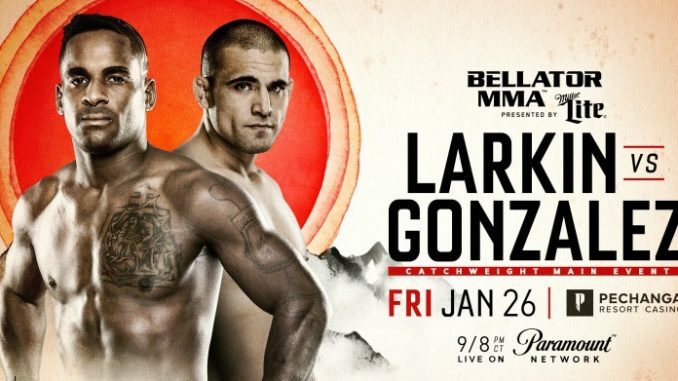 The team at The MMA Complex files a report on the main card from Bellator 193 on Friday, headlined by a catchweight bout between Lorenz Larkin and Fernando Gonzalez and also featured Saad Awad, Kendall Groves, and others in action. TEMECULA, Calif. – The MMA Complex is on the scene and reporting live from today’s Bellator 193 event, and you can join us for official results beginning at 7 p.m. ET (4 p.m. PT) from Pechanga Resort & Casino in Temecula, Calif. Round 1: It’s main event time; both fighters take the center of the cage feeling on out one another. Nothing significant in most of the round but a strong right low kick followed by a body kick from Lorenz Larkin to Fernando Gonzalez. Gonzalez answers that with a flurry of punches of his own pushing Lorenz back against the cage. Round ends with Lorenz putting Gonzalez off balance with a series of strikes of his own, possibly getting the round in the process. Round 2: Round starts much like the first, a very tense fight with each fighter attempting big shots on the other. Gonzales is the aggressor in the round, keeping the center if the cage; Lorenz is definitely holding his own with some hard-hitting counter strikes. Although much of the round saw Gonzalez being the aggressor in the fight, its Larkin’s counter striking that seems to be on point tonight keeping the Menifee Maniac at a distance, second round for Larkin. Round 1: Fight open up with a low kick by Saad Awad. It’s a tentative first round for the two, in a feeling out process for much of the first. Saad Awad landing some vicious overhand rights and getting the better of JJ Ambrose. Round ends with JJ Ambrose having some success with the clinch work, taking down Saad Awad who immediately gets back on his feet. JJ attempts to take his back, and the round ends with the two in the clinch up against the cage, with the round leaning in favor of Saad Awad. Round 2: We open the round with the two taking the center of the cage, with Saad Awad getting the body lock takedown on JJ Ambrose. JJ struggles to get back on his feet, yet Saad Awad will not let go and takes JJ down once again getting his back and transitioning to mount. Round 1: No touch of the gloves the fight is underway. Hard shots landing by the two middleweights, Kendall Grove getting better of the exchanges, with spurts of kick and punches between the two. A.J. Mathews presses the action landing some aggressive body shot. It’s a strong finish to the round for both fighters with the round leaning towards Kendal Grove. Round 2: A.J. Mathews starts the second round much like the first taking the center of the octagon; Kendall Grove though is keeping the crafty middleweight at bay with his footwork, front kicks, and counter striking. With a strong finish to the round, A.J. Matthews’s pressure and a strong flurry of punches at the end of the round may have the judges giving him a slight nod in the round. Round 1: Round starts with Steve Kozola taking the center of the octagon pressing the action. With brief exchanges between the two in a feeling out process that did not take long, Jake Smith lands a left then right hook combination that dropped Steve Kozola, finishing the round with a hammer strike. The fight is called via knockout (punches) – Round 1, 0:57 for Jake Smith.